How to permanently delete files:- It is not for nothing that we are told that the information once fed to the cyber world is never truly deleted, even when we think we have successfully removed it. There are various ways by which anyone can recover that supposedly deleted info, and certainly we wouldn’t want that to happen to us. This easy recovery of data is a boon if we have by mistake lost some info and want to get it back, but it is a curse to the same degree when we wanted to permanently delete the data and instead find out it can be recovered quickly with a few simple tools. This becomes an even larger concern if say, we want to sell the hard drive, give it away to someone else, or simply want to remove certain data that is unwanted, embarrassing, or strictly confidential. What do we do then? Thankfully, just like there are methods to recover lost or deleted info, there are also tools and methods to permanently remove the data as well. Read also: – How to permanently delete the deleted files in a folder in Windows PC. That, of course, does not ever mean that we should store all kinds of data on our computers just on the basis of the knowledge that we can get rid of it by using anti-recovery tools- we must always be careful as to what sort of info we’re putting up n the cyber world for safety’s sake. That being said, in case we do have info that we want to delete, no problem- Read on to find out our top 8 tools to permanently delete data. This free disk cleaning software ensures that the data you deleted remains deleted. Put simply, what Moo0 does is it does not delete or overwrite the existing data, but it does make sure that what you meant to delete cannot be recovered. Moo0 has a simple and clean interface that lets the user choose from exactly which location he or she wishes to permanently delete files. 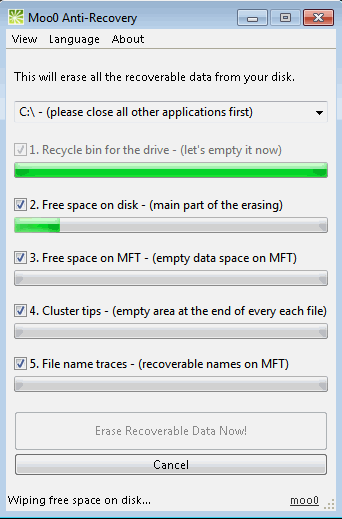 Moo0 opens a dialog box with five checkboxes in it, such as Recycle Bin, Free Space on Disk, etc, of which you can choose whichever is relevant to you as well as view the progress of file deletion for each of these locations. A small con of Moo0 is that clearing free space is a major function of the software, but it is a rather tedious and time-consuming process. However the rest of the functions don’t take nearly as long, so it is definitely software worth trying. 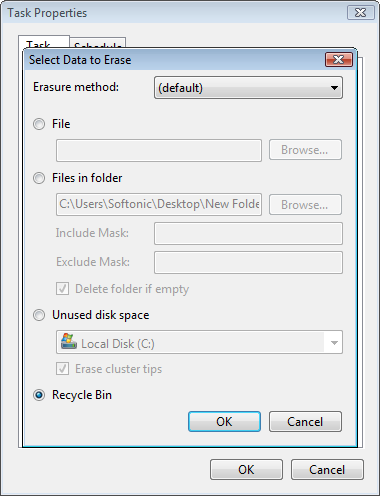 Eraser is another free software that performs the task of deleting data efficiently. What’s cool about Eraser is that it is able to work on removing single files as opposed to arbitrarily wiping free space on the drive. So while using Eraser, you can choose exactly which files you want removed individually. Eraser also offers a sort of timetable or schedule which allows you to fix certain times or certain days, on which you want Eraser to delete specific types of files for you as routine tasks, so you don’t have to set Eraser to work again and again. Eraser works by shredding the files you want to remove and overwriting those files several times with advanced algorithms. Eraser offers a lot of advanced tools to delete data, and may be a little boggling to beginner users, but is easy to catch up with. This software is really useful as it comes in a portable form- you can store it on your pen drive or other USB drives, and then use it on whichever system you want. WipeFile supports several languages- not all, but enough so that most users worldwide can find a language they are comfortable working with. WipeFile also has special filters by which the user can distinguish between different types of files to be shredded. There are tools within WipeFile by which the user can delete only, say, Word files, and leave the rest, and so on. 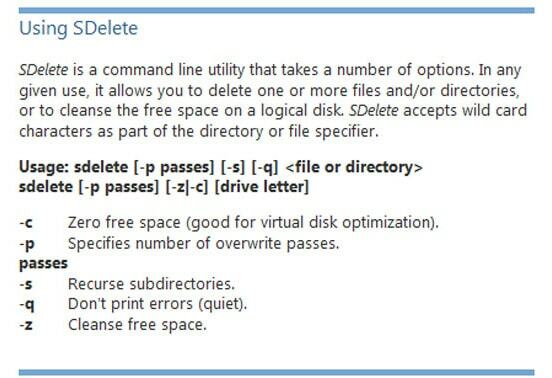 There are 14 methods offered by WipeFile in order to permanently delete data from the drive, quickly and efficiently. The only minor con is that the software launches in German language, so a user not familiar with German will have to navigate to the Extras option and then select Sprache, to change it to the language he or she wants. This software works safely without any damage to your existing files and data and removes the data you wish to delete quite easily. It works quite the same as any other file shredding software deleting files and making them impossible to recover by any other means. Disk Redactor’s USP lies in its guaranteed security- your data will never be at risk of damage if you use this software. Disk Redactor is also very simple to use, all you have to do after installing is launch the software choose the disk you wish to overwrite and let the software perform. A con, however, is that it securely deletes data but is not fully compatible with all systems. Moreover, it cannot individually wipe files, it can only overwrite entire disks, hence the name Disk Redactor. There is not much more to say about this relatively straightforward tool except that it is effective and quite hassle free. However, the recent version does seem to have a small problem, in that upon running the command, it doesn’t delete the requisite folder, rather one has to run the command a few times to get that desired result. 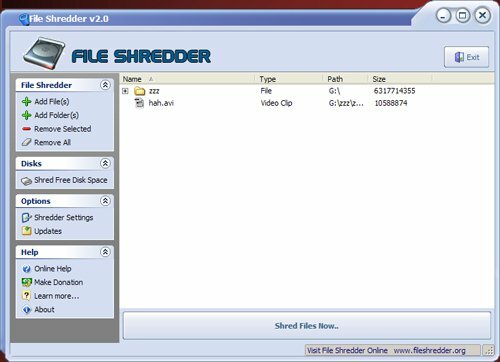 FileShredder is a completely free tool that securely and effectively removes any data you wish to delete from your drive. There is an integrated file shredder option within the tool which uses special shredding algorithm to wipe free spaces in the drive, and the user has the freedom to choose among five different algorithms, each specializing in removing data using different but powerful methods. The software is easy to use, occupies less space than several other tools such as Eraser and has a variety of features for deleting files. However, it takes up a lot of CPU capacity and offers very little online help. It also does not come with a built-in scheduler, but many other tools also don’t offer that feature, so this particular con is not very concerning. The developer has even explained why the software is available for free, and that’s a really cool gesture! 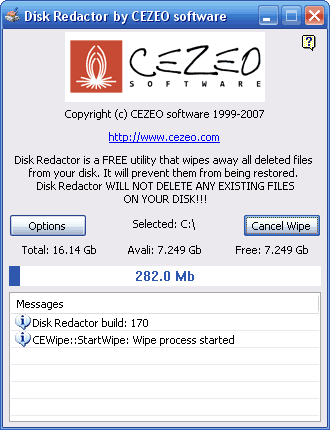 This software comes with a lot of cool features, including the ability to overwrite disks up to a hundred times, overwrite names of files, folders, and directories several times, support a variety of shredding and deleting algorithms, as well as being able to delete timestamps from files and folders easily. Turbo Shredder works smoothly on Windows systems, Mac as well as Linux operating systems, so that’s another plus point, given that most other file deletion tools out there are not multi-system compatible, Turbo Shredder allows the user to drag and drop files to be deleted permanently, or use the +option to do the same. It is very easy to operate, and it is also portable, making it easy to carry around on a USB and use whenever and wherever. However, it does require the Java Runtime Environment to be installed so it can work- and that in itself can be a con if you plan to carry it on a USB unless you can guarantee that all systems you may use it on have Java Runtime installed on them. HardWipe is a file deletion tool that comes in a nice, descriptive yet noncluttered interface. It offers the user six types of shredding algorithms to choose from, and the opportunity to rename files and folders as many as ten times, just to make completely sure that the file names cannot be recovered in any way. HardWipe comes in a portable edition, for those users who prefer On The Go utilities, and it is also available in a setup format for the other users. You can use HardWipe to remove data from the Recycle Bin, clear spaces in the disk, and delete data from physical devices as well. A con of HardWipe is that unless you upgrade to the paid premium version (there’s always a catch, isn’t there?) you will have to withstand the constant appearance of advertisements while you work with the application. However given that it is free and fully functional, as well as the organized interface, makes this a tool fit for use to permanently delete data securely.